I’m on a flight to India, typing this on my iPad, using an Apple Bluetooth Keyboard in my lap. 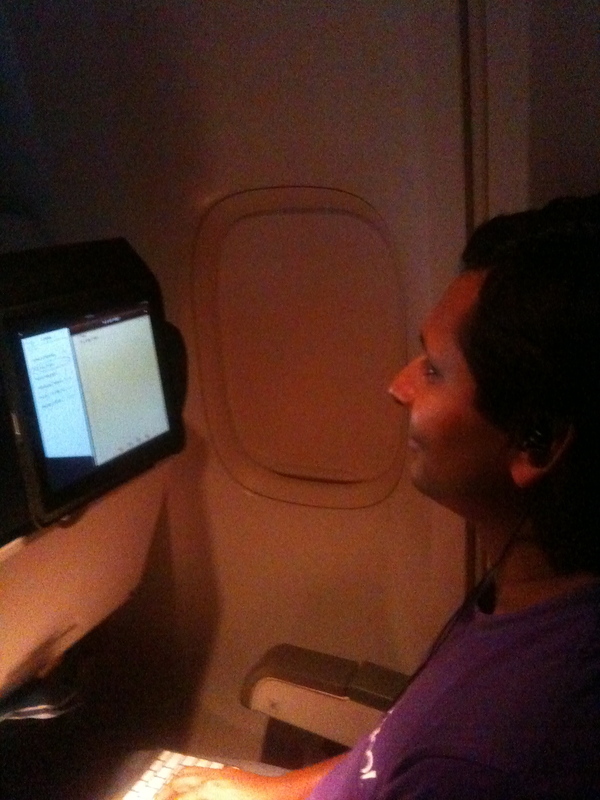 The iPad is mounted on top of the seat in front of me – putting the iPad right at eye level. Ergonomically, this is a hard setup to beat. ‘Lap height’ is usually the best height for keyboards, and eye-level when sitting upright is best for viewing screens. With this setup, I’m not balancing laptops on clumsy trays, and I’m not bending my neck way down to read small text on a laptop for 10 hour stretches. As a bonus, I don’t have to constantly worry and adjust laptop angles when the dude in front leans back. The incredibly long-lasting iPad battery helps a lot, as do the nice Shure in-ear headphones. Perfect companions to really long flights like this one! Of course, this is also a great setup to watch movies on the iPad, play games, etc – maybe I’ll do that next time. I am curious. how did you mount the iPad on the front seat? On some planes, the headrest on the seats have some ‘give’ that lets you insert the ipad flap. This of course doesn’t work with iPad2. There are also mounting products like this one – http://www.mipow.com/product_detail.php?pid=20&lang=en – I’m considering buying one of them for the future. sounds dangerous. what if the guy in front decides to adjust his headrest?! It’s not bad at all, the rig is fairly resilient.